For image-based infection biology, accurate unbiased quantification of host–pathogen interactions is essential, yet often performed manually or using limited enumeration employing simple image analysis algorithms based on image segmentation. Host protein recruitment to pathogens is often refractory to accurate automated assessment due to its heterogeneous nature. An intuitive intelligent image analysis program to assess host protein recruitment within general cellular pathogen defense is lacking. We present HRMAn (Host Response to Microbe Analysis), an open-source image analysis platform based on machine learning algorithms and deep learning. We show that HRMAn has the capacity to learn phenotypes from the data, without relying on researcher-based assumptions. Using Toxoplasma gondii and Salmonella enterica Typhimurium we demonstrate HRMAn’s capacity to recognize, classify and quantify pathogen killing, replication and cellular defense responses. HRMAn thus presents the only intelligent solution operating at human capacity suitable for both single image and high content image analysis. Editorial note: This article has been through an editorial process in which the authors decide how to respond to the issues raised during peer review. The Reviewing Editor's assessment is that all the issues have been addressed (see decision letter). High content imaging (HCI) has revolutionized the field of host–pathogen interaction by allowing researchers to perform image-based large-scale compound and host genome-wide depletion screens in a high-throughput fashion (Brodin and Christophe, 2011; Mattiazzi Usaj et al., 2016). The majority of these screens assess host–pathogen interactions using bulk colorimetric or automated enumeration of pathogen growth at the population level (Ang and Pethe, 2016; Radke et al., 2018). Additionally, quantification of host–pathogen interaction (e.g. analysis of host protein recruitment to the pathogen) in general is often performed manually. However, to meaningfully dissect cell-mediated pathogen control, it is imperative to quantify the host response and pathogen fate at the single-cell level. Many open-source, e.g. CellProfiler (Carpenter et al., 2006), and proprietary, e.g. Perkin Elmer Harmony, analysis software packages have been developed and successfully employed for this purpose (Eliceiri et al., 2012; Stöter et al., 2013; Smith et al., 2018). To advance the state of the art in image analysis of host–pathogen interaction, incorporation of cutting-edge machine intelligence algorithms (Simonyan and Zisserman, 2014; LeCun et al., 2015) to stratify the image content without the requirement to program complex integrations is needed. HRMAn relies on the same well-established image segmentation strategies as many other programs but offers an intuitive integration of deep learning for more complex image analysis. Solutions existing to date can be split into two major categories: user-friendly turn-key GUI (TK-GUI)-based solutions and scripts ensembles (SE) solutions. Due to the large support burden of the TK-GUI, these programs lack the implementations of the latest engineering advances. At the same time SE solutions are easier to update but are far from user-friendly and are difficult to migrate between installations. Deep neural network-based machine intelligence methods have brought about a revolutionary advance in the field of computer vision, by allowing for learning of complex morphologies in a highly generalized fashion (Krizhevsky et al., 2012; LeCun et al., 2015). To date, these methods have not been adapted for the field of host–pathogen interaction. Typically, HCI based fluorescent imaging data from a host–pathogen interaction experiment is analyzed by classical image segmentation (Osaka et al., 2012; Schmutz et al., 2013; Kühbacher et al., 2015; Ovalle-Bracho et al., 2015). Occasionally segmentation combined with machine learning based on calculated features has been employed (Kreibich et al., 2015). Most of these analysis pipelines make use of open-source programs tailored with additional coding by the user to suit their specific needs and are not published in their final form as a universal open-source solution. A major short-coming of these classical image segmentation and machine learning analysis methods is that they fail at the level of quantifying host protein recruitment to the pathogen. This is largely due to the fact that traditional algorithms quantify phenotypes in a rule-based manner, using bulk statistical properties of microscopy images or their segments. Conversely, deep neural networks make use of complex patterns (e.g. shapes) within the dataset to learn phenotypes and their diversity. The neural network derives these patterns in an automatic fashion from expert-labelled data. Thus, using pattern complexity to refine classification (Krizhevsky et al., 2012), deep neural networks improve the biological relevance of the phenotypic readouts. While some proprietary solutions have been employed to extract host protein recruitment data, these are impractical and insufficient for most researchers as they are tied to single and expensive microscopes and do not operate at human capacity (Polajnar et al., 2017; Touquet et al., 2018). To date, for the analysis of host protein recruitment to pathogens, artificial intelligence-driven automated analysis is neither available as an open-source nor as a commercial package. Thus, there remains a need for an open-source, intuitive, flexible, and trainable host–pathogen interaction analysis software that performs at the level of human analytic capacity (Russakovsky et al., 2015; He et al., 2015; Haberl et al., 2018). 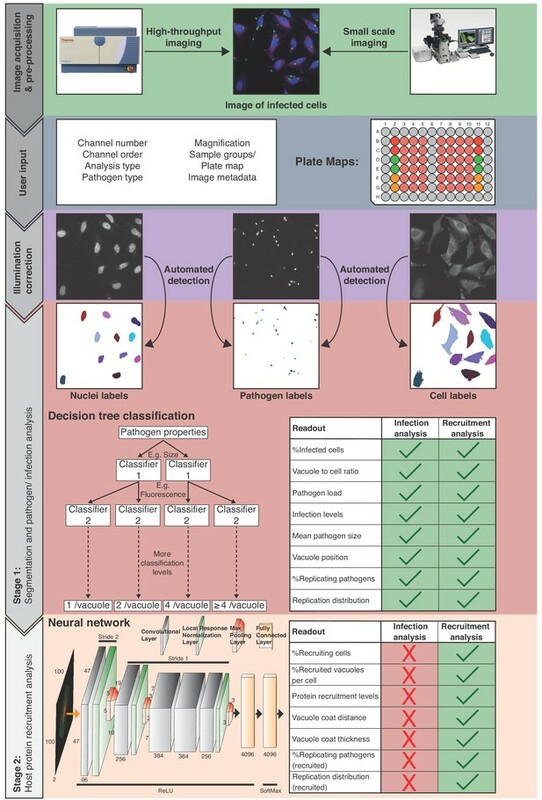 Here we present a high-throughput, high-content, single-cell image analysis pipeline that incorporates machine learning and a deep convolutional neural network (CNN) ensemble for Host Response to Microbe Analysis (HRMAn; https://hrman.org/). To assure its broad applicability to infection biology, HRMAn is based on the data integration environment KNIME Analytics Platform (Berthold et al., 2008). The analysis relies on training of machine learning algorithms and deep neural networks that can be tailored to individual researchers’ needs. The HRMAn pipeline (Figure 1), is designed to work with all file types acquired on any HCI platform or fluorescence microscope. Plate maps including experimental layouts, sample groups and replicates can be loaded, enabling HRMAn to automatically cluster results and perform error analysis. Once fed into the HRMAn pipeline, images are automatically pre-processed and clustered based on user-defined parameters (i.e. imaging specifications) and corrected for illumination. The subsequent image analysis proceeds in two stages: in stage 1, HRMAn segments images into pathogen and host cell features for single cell analysis. It then classifies these features using a decision tree learning algorithm previously trained on an annotated dataset. In stage 2, HRMAn analyzes host cell features associated with the pathogens using a CNN HRMAlexNet (derived from AlexNet architecture) trained to distinguish complex phenotypic patterns of host-protein recruitment (Krizhevsky et al., 2012). Robust classification is achieved by passing segmented regions of interest through multiple non-linear convolutional filters to identify characteristic phenotypic details. Overview of the HRMAn pipeline. Following image acquisition, on a high-content imaging platform or any other fluorescence microscope, the images can be loaded into the HRMAn software. First, the data is pre-processed and clustered based on user-defined parameters and provided plate maps. Images then undergo illumination correction and automated segmentation using Huang algorithm. Segmented images are used by a deep convolution neural network (CNN) and other machine learning based algorithms to analyze infection of cells with intracellular pathogens. Depicted is the CNN diagram representing two-dimensional convolutional filters with respective width, height and depth designated on filters facets. Respective change of stride in the groups of hidden layers is depicted above the diagram, while respective activation functions below the diagram. Finally, the data is written as a single file and will provide the researcher with more than 15 different readouts that describe the interaction between pathogen and host cell during infection. HRMAn is based on the open-source data integration environment KNIME Analytics Platform making it modular and adaptable to a researcher’s needs. The analysis is based on training of the machine learning algorithms generating high flexibility, which can be tailored to the needs of the user. Finally, data are output as a single spreadsheet file providing the researcher with ≥15 quantitative descriptions of a pathogen and its interaction with host factors at population and single cell levels (Figure 1; Readouts). Importantly, by separating the analysis, HRMAn offers researchers the flexibility to perform fast, simple quantitative analysis of infection parameters using stage 1, without analyzing host protein recruitment. To train for detection and analysis of host–pathogen interactions, HRMAn was provided an annotated dataset of host cells infected with an eGFP-expressing version of the parasite Toxoplasma gondii (Tg) and stained for various host cell features (Figure 2A) (Seibenhener et al., 2004; Clough et al., 2016). For stage one pathogen detection and enumeration training a simplistic ML strategy – decision tree performed remarkably well. Over 35,000 Tg-vacuoles were analyzed by decision tree, gradient boosted tree, and random forest machine learning classification algorithms and cross-validated (Figure 2B). As each performed equally, a simple decision tree with Minimum Description Length (MDL) pruning, to limit overfitting, was employed for speed and accuracy of pathogen detection (>99.5% for Tg). Using these parameters, in addition to the readouts from stage 1 (see Figure 1), HRMAn detected and quantified Tg-containing vacuoles harbouring 1, 2, 4 or >4 fluorescent Tg (Figure 2C). Decision-tree and convolutional neural network training for pathogen replication and host defense protein recruitment analysis. (A) Example images from one field of view. A composite image of all channels (blue: nuclei, green: Tg, red: Ubiquitin, grey: p62) and the single channel images are shown. Scale bar indicates a distance of 30 μm. (B) Training and cross-validation of different machine learning classification algorithms to predict parasite replication. (C) Example images of different vacuoles with the resulting classification of a trained decision tree classifier. Scale bar, 5 μm. (D) Resulting classification of the trained deep convolution neural network (CNN) with example vacuoles. For the recruited classification a class activation map (CAM) is depicted to illustrate the focus of the CNN. (E) Decrease of negative log likelihood (NLL) used as loss function during CNN training over training cycles (epochs) for Toxoplasma gondii model (left) and confusion matrix of Toxoplasma gondii model validation illustrating classification accuracy of labelled data unseen by the model, classification accuracy (0 to 1) during validation is colour-coded blue to red and indicated in the figure (right). For stage 2, host protein recruitment, the CNN was trained for ubiquitin and p62 recruitment using segmented Tg vacuoles defined in Stage 1. Robust classification of host protein recruitment was achieved by passing these regions of interest through multiple non-linear filters to identify and differentiate between no recruitment, recruitment, and analysis artefacts (Figure 2D). Training over 80 epochs with negative log likelihood as a loss function, the deep CNN achieved 92.1% classification accuracy confirmed by expert-based cross-validation. Precision for ‘no recruitment’, ‘recruitment’, and ‘artefacts’ classes was 0.92, 0.92 and 0.71, while recall was 0.94, 0.89 and 1 respectively, hence achieving the accuracy of a human operator and far exceeding human capacity (Figure 2E). To assure that uninvaded Tg parasites do not skew the data, stringent synchronization of infection by centrifugation and washing procedures were employed. In a pilot experiment (Figure 2—figure supplement 1), staining with the Tg vacuole marker GRA2 (Figure 2—figure supplement 1A–B) revealed that more than 98% of all parasites captured in the images have successfully invaded and established a PV, irrespective of the Tg strain used for infection (Figure 2—figure supplement 1B). Using a multiplicity of infection (MOI) of 3 for experiments resulted in up to 90% type I and 80% type II Tg infected host cells (Figure 2—figure supplement 1C). In line with this, we often observed that a single host cell can contain more than one PV. To demonstrate the ability of HRMAn and to expand how researchers define and classify host–pathogen interactions, the impact of IFNγ on Tg replication and ubiquitin/p62 recruitment to Tg vacuoles was analyzed (Figure 3). Analysis of Toxoplasma gondii infection in IFNγ-treated HeLa cells. HeLa cells were stimulated with 100 IU/mL IFNγ, infected with type I (RH) Toxoplasma gondii (Tg) and analyzed 6 hr post-infection. (A) Infection parameters depicted as total percent of Tg infected cells, the ratio of Tg vacuoles to cells and the ratio of parasites to cells. (B) Cellular readouts showing the proportion of cells that contain a varying numbers of parasite vacuoles, the mean vacuole size of Tg and the vacuole position as the value of the mean Euclidian distance of Tg vacuoles to the host cell nucleus. (C) Replication capacity of Tg shown as the proportion of replicating parasites and the distribution of replicating Tg. (D) Cellular response to infection with Tg measured as the percentage of cells that decorate vacuoles and the average proportion of vacuoles per cell that are being decorated simultaneously and the overall proportion of ubiquitin and/or p62 decorated Tg vacuoles. N shows the total number of vacuoles analyzed for each condition, percentages are indicated in the legend. (E) Properties of the host protein coat on Tg vacuoles as the average coat distance for ubiquitin and p62 to Tg and mean fluorescence intensity of ubiquitin and p62 at Tg vacuoles. (F) Fate of Tg vacuoles grouped based on host protein recruitment. The proportion of replicating parasites and the replication distribution based on recruitment status of the vacuole are shown. All data shown above represent the mean of N = 3 experiments±SEM. Significance was determined using unpaired t-tests, n.s. = not significant, *p≤0.05; **p≤0.01, ***p≤0.001, ****p≤0.0001. Previous reports indicate that HeLa cells restrict the growth of Tg through ubiquitination of parasitophorous vacuoles and subsequent non-canonical, p62-dependent autophagy (Selleck et al., 2015; Clough et al., 2016). HeLa cells infected with eGFP Tg ±IFNγ were fixed 6 hr post-infection (hpi) and stained with Hoechst (nuclei) and antibodies directed against ubiquitin and p62. A total of 1,350 4-colour images were acquired on an automated microscope and loaded into HRMAn for analysis. HRMAn automatically detected and analyzed more than 15,000 HeLa cells resulting in 15 quantitative outputs of host–pathogen interaction (Figure 3). Population level readouts from stage one indicated that IFNγ treatment did not impact the percentage of infected cells but decreased the number of vacuoles within host cells as well as the number of parasites per cell (Figure 3A). As eGFP fluorescence is lost when parasites are killed, a reduction in the ratio between vacuoles and host cells serves as an indirect measurement for parasite killing. At the single cell level, HRMAn found that IFNγ treatment resulted in a significant reduction of vacuoles per cell and a minor reduction in mean vacuole size, without impacting vacuole position (Figure 3B). 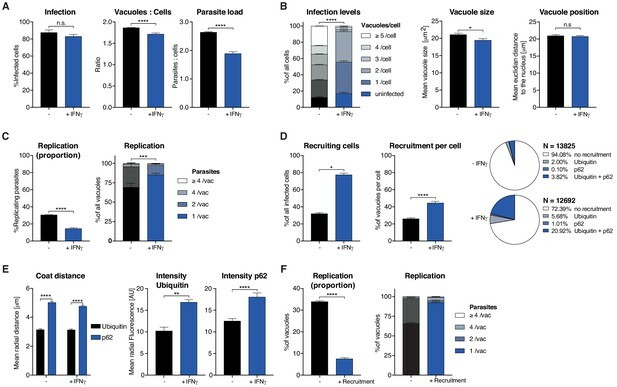 Concomitant with this reduction in vacuole size, both the percentage of replicating parasites, and the number of parasites per vacuole were significantly reduced by IFNγ treatment (Figure 3C). Thus, IFNγ−mediated control of Tg in HeLa cells involves both parasite-killing and restriction of Tg replication. Importantly, HRMAn offers a wide range of readouts in stage 1 analysis allowing for more detailed information on the dynamics of infection and clearance than typically seen with manual counting. To allow the user to decide which readouts are best suited to answer their specific research question some redundancy has been purposely built in (e.g. mean vacuole size vs. % Replicating). For example, here we focused on parasites per vacuole and the proportion of infected cells, as opposed to the number of individual vacuoles per host cell. In stage 2, analysis of the >25,000 vacuoles identified in stage 1, showed that the number of host cells with ubiquitin/p62-positive vacuoles and the percentage of ubiquitin/p62-positive vacuoles per host cell increased with IFNγ (Figure 3D). Distribution analysis indicated that in untreated cells, only 5.92% of vacuoles were decorated with ubiquitin, p62, or both. This number rose to 27.61% in IFNγ-treated cells, the majority of which (20.92%) were double-positive for ubiquitin/p62 (Figure 3D). By quantifying the radial fluorescence intensity distribution of these host factors, HRMAn revealed that ubiquitin was more closely associated with Tg vacuoles than p62 and that recruitment of both was increased by IFNγ treatment (Figure 3E). This is in agreement with the notion that p62 binds a ubiquitinated vacuole substrate through its UBA domain (Seibenhener et al., 2004; Clough et al., 2016). Finally, by analyzing vacuoles that recruit ubiquitin/p62, HRMAn indicated that restriction of Tg replication occurs in vacuoles decorated with these host defense proteins (Figure 3F). Collectively, this data indicates that in HeLa cells, IFNγ drives both parasite killing as well as recruitment of ubiquitin/p62 to Tg vacuoles, which acts to restrict parasite replication (Figure 3). The results demonstrate the capacity of HRMAn to provide a quantitative, multi-parametric readout of host–pathogen interaction at population and single-cell levels. As a high-throughput, high-content analysis program, HRMAn removes experimental size constraints imposed by manual quantification. To illustrate this, HRMAn was used to systematically analyze the impact of IFNγ treatment on type I and type II Toxoplasma strains in five human cell lines: HeLa (cervical carcinoma epithelial), PMA-differentiated THP-1 (macrophage-like), A549 (lung carcinoma epithelia), HFF (primary fibroblasts), and HUVEC (primary endothelial cells) (Figure 3—figure supplements 1–7). First, stage 1 HRMAn was used to ascertain the impact of varying concentrations of IFNγ (50–500 IU/ml) on Tg infection, killing, and replication. (Figure 3—figure supplement 1). For each host cell line (Figure 3—figure supplement 1A), a dose-dependent reduction in Tg infection was seen (Figure 3—figure supplement 1B). Assessment of the vacuole:cell ratio and mean vacuole size indicated that THP-1s, HFFs, and HUVECs limit infection by IFNγ-dependent Tg killing, while HeLas and A549s do so by restricting replication (Figure 3—figure supplement 1C–D). Quantification of the number of parasites per vacuole indicated that HeLas and A549s acutely restrict type I and type II Tg replication at all concentrations of IFNγ (Figure 3—figure supplement 2B–C), while THP-1s, HFFs, and HUVECs are far more limited in this capacity (Figure 3—figure supplement 2A,D–E). Next, HRMAn was employed on all 5 cell lines infected with either type I and type II Tg ±100 IU/ml IFNγ and immuno-stained for ubiquitin and p62. Figure 3—figure supplement 3–7 display the 15 quantitative readouts compiled by HRMAn of 9000 fields of view (~90 GB) and >175,000 vacuoles identified in stage 1. Taking advantage of the large-scale capabilities of HRMAn, we found that all host cell types can mediate IFNγ-dependent type I and II Tg killing (Figure 3—figure supplement 3B–C), and growth restriction (Figure 3—figure supplement 4A–B) to similar levels. Tg vacuoles show strain-dependent (A549, HUVEC), and strain-independent (HFFs) IFNγ-stimulated movement towards the nucleus (Figure 3—figure supplement 4C). HRMAn revealed that type II Tg grew slower than type I Tg in each host cell line and that their growth decreased more upon treatment with IFNγ (Figure 3—figure supplement 5A–B). Consistent with this, stage 2 HRMAn showed that all cell types could recruit ubiquitin and/or p62 equally well (Figure 3—figure supplement 6A), while a greater percentage of type II vacuoles per cell were decorated in response to IFNγ-priming (Figure 3—figure supplement 6B). The exception to this were THP-1 cells, which did not mount a strain-specific response (Figure 3—figure supplement 6B). Distribution analysis further indicated that THP-1s display a higher intrinsic capacity to decorate Tg vacuoles than other cell lines, even in the absence of IFNγ (Figure 3—figure supplement 6C). While no cell-type dependent differences in ubiquitin or p62 coat distance were observed (Figure 3—figure supplement 7A), THP-1s not only decorate vacuoles with more ubiquitin upon IFNγ stimulation, they also appear to recruit p62 in an IFNγ-independent fashion (Figure 3—figure supplement 7B). Decorated vacuoles in all host cell types displayed a greater ability to restrict the growth of type II versus type I Tg upon IFNγ treatment (Figure 3—figure supplement 7C–D). These results highlight the ability of HRMAn to provide high-throughput and quantitative single-cell analysis of host–pathogen interactions at a scale not achievable by automated bulk or manual quantification. To demonstrate its flexibility, HRMAn was trained to recognize the bacterium Salmonella enterica Typhimurium (STm) - a pathogen 16x smaller than Tg (0.5 μm vs. 8 μm) - and then set to analyze the impact of IFNγ on bacterial killing, replication, and ubiquitin recruitment. Stage 1 outputs showed that similar to Tg (Figure 3), IFNγ treatment in HeLa cells reduced the ratio of STm vacuoles/cell and the bacterial load, without impacting the percent of infected host cells (Figure 4A). At the single cell level, HRMAn found a significant reduction in the number of STm vacuoles/cell, consistent with a reduction in vacuole size, percent of replicating bacteria, and reduced numbers of STm/vacuole (Figure 4B–C). These results demonstrate that HeLa cells can control infection with STm through IFNγ−dependent bacterial killing and growth restriction. Analysis of Salmonella enterica Typhimurium infection in IFNγ-treated HeLa cells. HeLa cells were stimulated with 100 IU/mL IFNγ, infected with Salmonella enterica Typhimurium (STm) and analyzed 2 hr post-infection. (A–C) Stage one infection analysis parameters. (A) Infection parameters depicted as total percent of STm infected cells, the ratio of STm vacuoles to cells and the ratio of bacteria to cells. (B) Cellular readouts showing the proportion of cells that contain a certain number of bacteria vacuoles, the mean vacuole size of STm and the vacuole position as the value of the mean euclidian distance of STm vacuoles to the host cell nucleus. (C) Replication capacity of STm shown as the proportion of replicating bacteria and the distribution of replicating STm. (D) Training of the deep convolution neural network (CNN) to analyze host protein recruitment to STm vacuoles and bacteria. Left: Example images showing the difference of no recruitment versus ubiquitin (magenta) recruitment to STm. Middle: Decrease of negative log likelihood (NLL) used as loss function during CNN training over training cycles (epochs) for STm model. Right: Confusion matrix of STm model validation, classification accuracy (0 to 1) during validation is colour-coded blue to red and indicated in the figure. (E) Cellular response to infection with STm measured through the percentage of cells that decorate vacuoles and the average proportion of vacuoles per cell that are being decorated simultaneously and the overall proportion of ubiquitin decorated STm vacuoles. N shows the total number of vacuoles analyzed for each condition, percentages are indicated in the legend. (F) Properties of the host protein coat on STm vacuoles as the average coat distance for ubiquitin to STm and mean fluorescence intensity of ubiquitin. (G) Fate of STm grouped based on host protein recruitment. Shown is the proportion of replicating bacteria and the replication distribution based on recruitment status of the vacuole. All data shown above represent the mean of N = 3 experiments±SEM. Significance was determined using unpaired t-tests, n.s. = not significant, *p≤0.05; **p≤0.01, ***p≤0.001, ****p≤0.0001. For stage 2, we used the Tg recruitment model as input to retrain HRMAn for quantification of ubiquitin recruitment to STm (Figure 4D). This allowed us to achieve 69.9% classification accuracy, confirmed by expert-based cross-validation, in just 40 epochs using 10-fold less non-augmented image data (Figure 4D). It’s known that HeLa cells restrict STm growth by maintaining vacuole integrity; the small percentage of bacteria that escape vacuoles are decorated with ubiquitin and subsequently cleared by autophagy (Noad et al., 2017; van Wijk et al., 2017). Interestingly, stage 2 HRMAn showed that the percent of host cells which recruit ubiquitin to STm doubles upon IFNγ treatment, while the percent of decorated vacuoles/cell increases only slightly (Figure 4E). As seen with Tg (Figure 3E, Figure 3—figure supplement 7A), IFNγ does not impact the distance of the ubiquitin coat to STm but increases its thickness (Figure 4F). This indicates that more ubiquitin is recruited to cytosolic STm in the presence of IFNγ and growth of decorated bacteria was restricted (Figure 4G). Consequently, although IFNγ treatment increases the number of host cells that recruit ubiquitin to STm and the intensity of that recruitment, at the single-cell level HeLa cells appear to have reached their capacity for detection and autophagy-mediated clearance of cytosolic/ubiquitinated STm independent of IFNγ treatment (Figure 4E–G). To illustrate the versatility of HRMAn and the advantage of the modular architecture combined with the accessible user interface that comes with the KNIME Analytics platform, we performed experiments to stress HRMAn’s applicability and adaptability to study pathogen-driven parameters of infection. Using transgenic Tg lines expressing different parasite virulence factors, we were able to reproduce and expand upon published data (Virreira Winter et al., 2011). 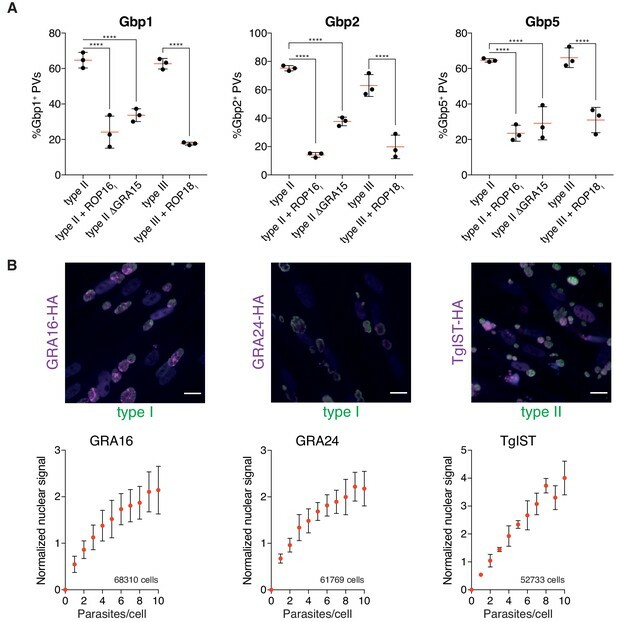 We confirmed that expression of ROP16 from type I Tg or lack of GRA15 in otherwise isogenic type II parasites (PruA7) reduces the recruitment of murine guanylate binding proteins (Gbps) to the vacuoles. Similarly, expression of type I ROP18 in type III parasites (CEP) also reduced recruitment of murine Gbps 1, 2 and 5 compared to isogenic type III parasites (Figure 5A). This analysis shows that HRMAn can be used to study effects of pathogen effector proteins on an established host phenotype. HRMAn can be adapted to study pathogen biology. (A) HRMAn-based quantification of Gbp recruitment to Tg vacuoles. Red lines show mean ± SEM of N = 3 experiments. (B) Quantification of Tg protein secretion and translocation to the host cell nucleus. HFF cells were infected with type I Tg expressing GRA16-HA or GRA24-HA or with type II Tg expressing TgIST-HA and fixed after 18 hr. Secreted proteins were visualized by staining with anti-HA (magenta) and Tg was stained with anti-SAG1 (green). Scale bar, 20 μm. 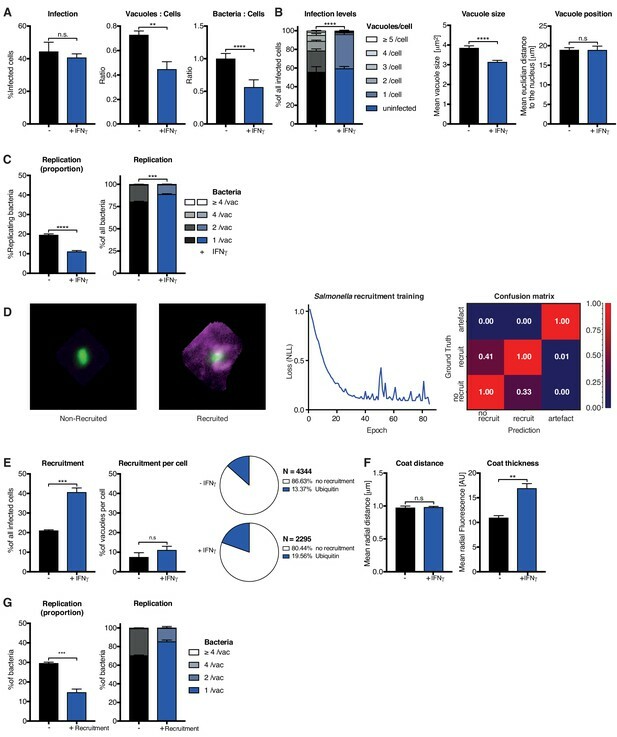 Fluorescence signal in the host cell nucleus was quantified, correlated to the number of parasites per cell and normalized to the signal of uninfected cells. Overall number of analyzed cells are indicated in the graphs. Data represented as mean ± SEM of N = 3 experiments. Significance from one-way ANOVA comparing to the respective WT, n.s. = not significant, *p≤0.05; **p≤0.01, ***p≤0.001, ****p≤0.0001. Next, we asked whether HRMAn can accurately measure parasite effector proteins targeted elsewhere within infected host cells. Tg is known to secret multiple effector proteins upon invasion and during replication. Examples include the parasite proteins GRA16, GRA24 and TgIST, that are secreted beyond the boundaries of its PV and subsequently translocated to the host cell nucleus (Bougdour et al., 2013; Braun et al., 2013; Gay et al., 2016). Using HRMAn, we were able to visualize accumulation of these three Tg effector proteins (tagged with an HA-tag) in the nucleus of the host cell. HRMAn, further indicated that the levels of nuclear accumulation correlated to the number of parasites contained within the infected cell (Figure 5B). Thus, HRMAn can be employed to analyze both host and parasite parameters during infection in an unbiased, accurate and high content manner. Recent advances have made deep CNNs a powerful image analysis method (Simonyan and Zisserman, 2014; He et al., 2015; Ioffe and Szegedy, 2015; LeCun et al., 2015; Russakovsky et al., 2015; Haberl et al., 2018). Inspired by abstraction of animal visual cortex architecture, CNNs are able to generalize patterns independent of minor phenotypic differences (Hubel and Wiesel, 1968; Matsugu et al., 2003). Combining automated image segmentation, machine learning and a deep CNN in an ensemble, HRMAn is a powerful open-source, user-friendly software for the analysis of host–pathogen interaction at the single-cell level. We based HRMAn on the KNIME Analytics Platform (Berthold et al., 2008). Being highly modular, GUI-based and user-friendly, HRMAn can rapidly be updated with latest technological advances, yet remains transparent for the average user. Furthermore, the ready-to-use DL4J library modules we employed allow for incorporation of the latest advances in the field of artificial intelligence in a click-through manner with zero coding. To date, HRMAn represents the only open-source CNN-driven host-pathogen analysis solution for fluorescent images. While HRMAlexNet is a rather simple architecture, more complex architectures can be easily implemented through recently introduced KNIME-Keras integration (Chollet, 2015), which may facilitate improvement in the classification accuracy. This is important, as it moves the phenotype of host defense protein recognition of pathogens into the realm of HCI at the level of artificial intelligence and thus human accuracy and capacity. Many automated image analysis programs, some of which incorporate machine learning elements, have been developed and are successfully used for classical image segmentation (Supplementary File 1). However, when presented with the problem of classifying host protein recruitment to a pathogen, inaccurate classical image segmentation could lead to erroneous results. Employing an artificial intelligence algorithm, HRMAn circumvents these problems and delivers user-defined automated and unbiased enumeration of this subset of the host-pathogen interplay. Using Tg and STm infection models, we demonstrate that HRMAn is capable of detecting and quantifying multiple pathogen and host parameters. Importantly, we show that HRMAn can be adapted easily to two entirely different pathogens, that not only differ in size by a magnitude, but also display distinct growth rates and infection dynamics. The easy adaption of HRMAn for different pathogens and research questions will prove useful for any lab working in image-based infection biology. Designed for biologists, HRMAn requires no coding or specialized computer science knowledge. Its modular architecture and the use of KNIME, which provides a graphical representation of the analysis pipeline, allows users to tailor experimental outputs to their own datasets and questions. As the models we have generated can be used as primers to lower the training dataset size, computation power and training time requirements, HRMAn can be rapidly applied to similar large-scale, image-based experimental setups. As such, HRMAn will allow a broad range of researchers to extend into the realm of high-throughput, unbiased, quantitative single-cell analysis of host–pathogen interaction. All open-source KNIME workflows used in this publication can be found at: https://github.com/HRMAn-Org/HRMAn and on the homepage https://hrman.org/ under GPLv3 open-source software license to allow for rapid and open dissemination and free availability for the research community. The models and their respective weights obtained through training will be deposited on GitHub and the homepage as well. All images used to train the neural networks and other machine learning algorithms in this study are available upon request. For simple infection analysis (stage 1), 96-well plates (see Microscopy sample generation) were imaged on an ArrayScan VtI Live High Content Imaging Platform (Thermo Scientific) using 20x magnification and depending on the experiment, 15–20 fields of view per well. For recruitment analysis to Toxoplasma gondii (Tg) vacuoles, glass-bottom 96-well plates were imaged on an ArrayScan VtI Live High Content Imaging Platform but using 40x magnification and depending on the experiment, 50 fields of view per well. In both cases, following image acquisition, the images were exported from HCS Studio Cell Analysis Software as single channel 16-bit tiff files before they were fed into the HRMAn analysis pipeline. For recruitment analysis to Salmonella enterica Typhimurium (STm) vacuoles, images of coverslips were acquired on a Ti-E Nikon microscope equipped with an LED-illumination and an Orca-Flash4 camera using a 60x magnification. 75 fields of view per coverslip were acquired using multi-position acquisition. Images were exported as single channel 16-bit tiff files with Nikon NIS Elements software before they were fed into the HRMAn analysis pipeline. Generally, HRMAn can work with any common image file format, but the use of uncompressed, lossless formats like tiff (or png) is recommended. Furthermore, HRMAn can work with images acquired on any type of fluorescence microscope and is truly platform independent. Following image acquisition, the images were loaded into the HRMAn pipeline. Images can be in any common file format, preferably as single-channel tiff files. The used image reader loads images from all file formats supported by SCIFIO (more information can be found here: http://scif.io). If the images were not acquired on a high-content imaging platform, they can be renamed with HRMAn to mimic the file names and the plate format. This is needed to cluster the output data and perform error calculation. Furthermore, the OME-XML-metadata is loaded and information on the image is extracted (e.g. image size, type and origin). While the images are loaded into KNIME, the user is asked to provide some basic information on the image acquisition and the type of analysis to be performed. This includes the used magnification, type of analysis, channel number and order and providing a plate map to cluster the data. Nuclei are detected using Otsu’s method thresholding (Otsu, 1979), a watershed and connected component analysis. Fields of view containing insufficient numbers of nuclei (i.e. empty fields) are excluded from the following analysis. The pathogens (or vacuoles) are detected after image normalization and filtering through thresholding using Otsu’s method. Incomplete labels are corrected by filling holes and pathogen vacuoles are separated through water-shedding. Labels are created with a connected component analysis. Cell labels are created using Huang thresholding (Huang et al., 2004) and a Voronoi segmentation using the nuclei labels as starting points. Optionally the images can be enhanced using Contrast Limited Adaptive histogram equalization (CLAHE) to improve the segmentation accuracy. All cell labels touching the border of an image are excluded from the analysis. Furthermore, the created labels are filtered based on their size and the user-defined parameters such as magnification and detector size. The filter values for STm and Tg were empirically determined using thousands of images from different experiments. Based on which pathogen type is chosen by the user, HRMAn will adjust the filters automatically. Using labelling arithmetic, pathogen labels that are not contained within a cell label are removed from the dataset, as they represent extracellular pathogens. The created labels can then be inspected by the user through an interactive label viewer displaying the original image next to the labels. Using the vacuole labels, of vacuoles contained within cells, and working on the original images the properties of the vacuoles are measured as mean values for each well. These include mean vacuole size, shape descriptors (Circularity, Perimeter, Convexity, Extent, Diameter) and fluorescence properties (Minimum, Mean and Maximum Fluorescence). Using the above determined values as attributes, a decision-tree machine learning algorithm determines good classifiers and employs them to classify each vacuole label Vi based on how many individual pathogens PVi it contains. This step requires providing an annotated dataset. This concludes stage 1 infection analysis performed by HRMAn. In the end of the analysis, the values calculated for each well or replicate is combined with the values for the other wells belonging to the same sample group based on the user-provided plate map and error calculation is performed. If the user decides to perform only stage 1 infection analysis the HRMAn image analysis pipeline will stop here, if host protein recruitment analysis is to be performed the data will be fed into the second stage for which the implemented deep Convolutional Neural Network (CNN) has to be created and trained first. To classify pathogen recruitment, we employed a deep Convolutional Neural Network (CNN) HRMAlexNet (Figure 1) inspired by published AlexNet (Krizhevsky et al., 2012). Our architecture consisted of a total of 5 convolutional layers, where the first two were immediately followed by local response normalization layers and max pooling layers. The last three convolutional layers were followed by one max pooling layer connected to a fully connected layer. All these layers used rectified linear unit (ReLU) as activation function (Nair and Hinton, 2010). To ensure our neural network can be implemented by other researchers with no coding, it was based on the open source DeepLearning4J library implementation in KNIME Analytics Platform. Changes to the original AlexNet architecture were partially introduced by the KNIME AG team and partially by us in the process of optimizing the architecture to the fluorescence microscopy data. Here further improvements in architectures may be made through recently introduced KNIME-Keras integration (Chollet, 2015). While having the same number of convolutional layers as AlexNet, as introduced by the KNIME team, their dimensions are different. HRMAlexNet has two fully connected layers instead of three, which pushes the fitting burden more to the convolutional layers (Figure 1). We have changed the input layer dimensions to fit the multichannel fluorescence microscopy data, since our input two channels, rather than the standard RGB dimension of three. Hence, unlike the original AlexNet, HRMAlexNet was suited to take 100 by 100 by two pixels images as input and designed to run on a single graphic processing unit (GPU). Furthermore, we have modified the SoftMax (Bishop, 2006) output layer of the architecture to fit our dataset and classification problem. While optimizing the network’s hyperparameters, we found that learning rate updating algorithm proposed by default in the KNIME architecture, as well as in Krizhevsky et al. - Stochastic Gradient Descent (SGD) with Nesterov momentum - was failing to converge on our fluorescence microscopy data (Krizhevsky et al., 2012). Therefore, we have substituted this algorithm for the more advanced learning rate update algorithm ADAM (Kingma and Ba, 2014) with both mean and Variance decay parameters, which proved to converge well on various data and initial learning rate ranges. The choice of DeepLearning4J as a deep learning library allowed us to use 16-bit microscopy images directly, preventing information loss upon conversion of scientific imaging data. Our deep learning hardware was based on a single Nvidia 1080 Ti GPU set up in Intel Core i7 4790K system equipped with 32 Gb of RAM and a SSD. Our neural networks were trained using SGD based backpropagation (using ADAM updater with ADAM Mean Decay of 0.9 and ADAM Variance Decay of 0.999 (Kingma and Ba, 2014)) on the augmented original data over at least 80 epochs. To fully utilize the GPU capacity, training was performed in mini-batches of 200. We employed the Xavier algorithm for the weight initialization strategy and negative log likelihood (NLL) as our loss function (Kingma and Ba, 2014). We used learning rates between 0.001 and 0.01 adjusted accordingly to ensure the optimal loss curve decay during training. Together with the weights initialization strategy and the updater choice these were the main hyperparameters optimized in multiple iterations to ensure good training process. To visualize the attention of the trained HRMAlexNet, we have created a class activation map (CAM) based on a test image from ‘recruitment’ class (Figure 2). Since HRMAlexNet architecture does not have a Global Average Pooling layer to visualize the CAM we have used the occlusion technique (Zeiler and Fergus, 2013). Vacuole images used for creation of our deep learning model were segmented from large field of view micrographs obtained from high-content imaging. To ensure the dimension of the images are uniform, we padded all vacuole with zero-value padding to a uniform 100 by 100 pixels size. Next, we manually labelled the segmented vacuoles into recruited, non-recruited and artefactual (in case of erroneous segmentation of the vacuole). This labelled dataset was then split into the training and test datasets. To ensure our neural network has sufficiently diverse learning data, upon splitting the original labelled dataset into training and test subsets we performed data augmentation using a custom developed macro for ImageJ. During the augmentation processing, the original labelled dataset was concatenated with a modified version of it. The modifications included various rotations, image reflecting, image translation within the field of view. As microscopy data are typically rotation-, translation- or reflection-invariant, such modification allowed us to create a better dataset aiming at a more generalized model. Model validation was performed using the non-augmented test fraction of the labelled dataset previously unseen by the model. For this, we used the trained model as first input and passed the labelled test data through the classifier in the second input. The classification accuracy was assessed by accuracy score, numbers of true positive, false positive, true negative and false negative, as well as Cohen’s kappa values. A direct summary of the accuracy was visualized in a confusion matrix illustrating a mismatch between original label (Ground Truth) and the class assigned by the classifier (Figure 2). For recruitment analysis, the vacuole labels created in stage 1 of the analysis are dilated over 20 iterations to create non-overlapping regions of interest (ROIs) around them. Simultaneously, the fluorescence images of the pathogen and the respective channel with fluorescence signal of the host protein are merged into a dual channel image. The created ROIs are used to crop the dual channel images, which creates images of the pathogen and its surrounding stained host protein. The images are clipped to 100 by 100 pixel and fed into a feedforward predictor (classification) which uses the provided and trained deep convolution neural network (CNN) to classify the pathogens vacuoles based on their coating. Once the vacuoles are separated into two groups, they are analyzed with the above described methods of stage one infection analysis but additionally comparing recruited versus non-recruited vacuoles. Thus, in addition to the overall infection parameters from stage one the user is provided with the same parameters but further layered for the cellular response. In the case of co-recruitment analysis, two images of each vacuole are created with both containing the pathogen signal, but each containing a different second channel, representing the different stainings. After classification with the CNN, the vacuoles can be compared for recruitment or co-recruitment and all the above described parameters are calculated for them individually. Using the previously determined label dependencies of vacuoles Vi and cells Ci and the classification of the vacuoles Vi by the CNN, HRMAn can furthermore calculate the proportion of cells that do respond to infection by decorating at least one vacuole and the proportion of vacuoles decorated per cell, if a single cell contains more than one pathogen vacuole. Furthermore, working only on the decorated vacuoles, we used a custom-made Fiji code to create a pixel-wise radial intensity profile starting from the pathogen centroid. The distance of the maximum fluorescence intensity is then used to define the distance of the coat from the pathogen centre. Moreover, the mean fluorescence intensity of the coat is determined and can be used as a readout for the amount of protein recruited to each pathogen vacuole. Finally, all mean values and errors for the replicate conditions, as defined by the user’s plate map, are calculated and written into a single spreadsheet file. Before this, the user can also define a scaling factor between pixel and actual metric values which will adjust the output values from pixel (px) to μm or to μm2 respectively. THP-1 (TIB202, ATCC; RRID:CVCL_0006) were maintained in RPMI with GlutaMAX (Gibco) supplemented with 10% FBS (Sigma), at 37 ˚C in 5% CO2. THP-1s were differentiated with 50 ng/mL phorbol 12-myristate 13-acetate (PMA, P1585, Sigma) for 3 days and then rested for 2 days by replacing the differentiation medium with complete medium without PMA. Cells were not used beyond passage 20. Human Umbilical Vein Endothelial cells, HUVECs, (C12203, Promocell), were maintained in M199 medium (Gibco) supplemented with 30 μg/mL endothelial cell growth supplement (ECGS, 02–102, Upstate), 10 units/mL heparin (H-3149, Sigma) and 20% FBS (Sigma). Cells were grown on plates, pre-coated with 1% (w/v) porcine gelatin (G1890, Sigma) and cultured at 37 ˚C in 5% CO2. HUVEC were not used beyond passage 6. HeLa (ECACC, Sigma; RRID:CVCL_0030), A549 (CCL-185, ATCC; RRID:CVCL_0023), mouse embryonic fibroblasts (MEF) and human foreskin fibroblasts, HFFs (SCRC-1041, ATCC; RRID:CVCL_3285), were cultured in DMEM with GlutaMAX (Gibco) supplemented with 10% FBS (Sigma), at 37 ˚C in 5% CO2. HeLa and A549 cells were not used beyond passage 25 and HFFs were not used beyond passage 15. All cell cultures were performed without addition of antibiotics and the cells were regularly tested for mycoplasma contamination by immunofluorescence, PCR and agar test and found to be mycoplasma-negative. All five cell lines used in this publication were stimulated for 16 hr in complete medium at 37 ˚C with addition of 100 IU/mL human IFNγ (285-IF, R&D Systems) prior to infection, if not indicated otherwise. Tg expressing luciferase/eGFP (type I RH, type II Prugniaud (Pru) and type III CEP), type II PruA7 (Kim et al., 2007), type II PruA7 + ROP16I, type II PruA7 ΔGRA15 and type II CEP + ROP18I (all from Virreira Winter et al., 2011) were maintained in vitro by serial passage on monolayers of HFF cells, cultured in DMEM with GlutaMAX (Gibco) supplemented with 10% FBS (Sigma), at 37 ˚C in 5% CO2. Type II Tg expressing TgIST-HA-Flag (Pru ΔKU80 + TgIST HF), type I Tg expressing GRA16-HA (RH ΔKU80 + GRA16 HA) and type I Tg expressing GRA24-HA-Flag (Pru ΔKU80 + GRA24 HF) were a gift from Mohamed-Ali Hakimi (Bougdour et al., 2013; Braun et al., 2013; Gay et al., 2016). Parasites were always passaged the day before infection onto new HFFs to obtain parasites with a high viability for infection. Tg were prepared from freshly 25G syringe-lysed HFF cultures in 10% FBS by centrifugation at 50 x g for 3 min and transferring the cleared supernatant into a new tube and subsequent centrifugation at 500 x g for 7 min and re-suspension of the pelleted parasites into fresh complete medium. Then, the parasites were added to the experimental cells at a MOI of 3 for both type I and type II strains. The cell cultures with added Tg were then centrifuged at 500 x g for 5 min to synchronize the infection. Two hours post-infection, the cultures were thoroughly washed two times with warm PBS (806552, Sigma) to remove any uninvaded parasites and fresh complete medium was added prior to culturing at 37 ˚C, 5% CO2 for the required time. Salmonella enterica Typhimurium 12023 strain containing the plasmid pFVP25.1, carrying gfpmut3A under the control of the rpsM constitutive promoter (Valdivia and Falkow, 1996) were grown in Luria Bertani (LB) medium supplemented with 50 µg/ml ampicillin (11593027, Gibco). Prior to infection, bacteria were grown to induce SPI-1 T3SS expression: cultures of STm were grown at 37°C in LB, diluted 1:50 into fresh LB containing 300 mM NaCl (746398, Sigma) the next morning and incubated shaking at 200 rpm until OD600 = 0.9–1.0 was reached. Bacteria were washed in medium without FBS before use. Cells were infected at a MOI of 50 and infections were synchronized by centrifuging bacteria onto the cells at 750 x g for 10 min. 15 min post infection, the cells were thoroughly washed three times with warm PBS to remove extracellular bacteria and medium containing 100 ug/mL Gentamicin (15750060, Gibco) was added for 30 min. Then, Gentamicin concentration was reduced to 10 μg/mL and cells were incubated further at 37°C, 5% CO2 for the appropriate amount of time. Antibodies used in this study were rabbit pAb anti-p62 (#PM045, MBL; RRID:AB_1279301), mouse mAb anti-GRA2 (A1298, Biovision) mouse mAb anti-ubiquitin FK2 (PW8810, Enzo Lifesciences; RRID:AB_10541840), mouse mAb anti-SAG1 (home-made) and rat mAb anti-HA (11867423001, Sigma). Secondary antibodies used were Alexa Fluor 647-conjugated goat anti-rabbit (A-21245, Invitrogen; RRID:AB_141775), anti-rat (A-21247, Invitrogen; RRID:AB_141778) or anti-mouse (A-21236, Invitrogen; RRID:AB_141725), Alexa Fluor 488-conjugated goat anti-mouse (A-11001, Invitrogen; RRID:AB_2534069) and Alexa Fluor 568-conjugated goat anti-mouse (A-11004, Invitrogen; RRID:AB_141371). For simple infection analysis, 30,000 THP-1s per well were seeded 5 days prior to IFNγ treatment and differentiated with 50 ng/mL PMA for three days and then rested for 2 days in complete medium. HFFs were harvested by washing a confluent monolayer with PBS and subsequent lifting of the cells with 0.05% Trypsin-EDTA (Gibco). Cells were centrifuged at 250 x g for five mins, re-suspended in fresh DMEM plus 10% FBS and 20,000 HFFs per well were seeded the day before IFNγ treatment. Similarly, HUVECs were harvested and 15,000 cells per well were seeded in complete medium the day before IFNγ treatment. A549s and HeLa cells were harvested in the same way and 8,000 cells per well were seeded the morning before IFNγ treatment. All cells were seeded on 1% (w/v) porcine gelatin (G1890, Sigma) pre-coated black-wall, clear bottom 96-well plates (Thermo Scientific). In the evening, all cells were treated with 100 IU/mL IFNγ or medium and left at 37°C, 5% CO2 overnight. The next morning the cells were infected with either Tg or STm as described above. After the appropriate infection duration, the infected cells were again thoroughly washed with warm PBS to remove as many uninvaded pathogens as possible and subsequently fixed with 4% methanol-free paraformaldehyde (28906, Thermo Scientific). Fixed specimens were permeabilized with PermQuench buffer (0.2% (w/v) BSA and 0.02% (w/v) saponin in PBS) for 30 min at room temperature. Then PermQuench buffer containing 1 μg/mL Hoechst 33342 (H3570, Invitrogen) and 2 μg/mL CellMask Deep Red plasma membrane stain (C10046, Invitrogen) were added and samples were incubated at room temperature for 1 hr. After staining, the specimens were washed with PBS five times and kept in 200 μL PBS per well for imaging. For recruitment analysis, the cells were prepared as described above, but they were seeded on 1% (w/v) porcine gelatin pre-coated black-wall, glass bottom 96-well imaging plates CG 1.0 (130-098-264, MACS Miltenyi) to allow higher resolution imaging. After fixation, cells were permeabilized identically and then stained with primary antibody diluted in PermQuench buffer for 1 hr at room temperature. After three washes with PBS, cells were incubated with the appropriated secondary antibody and 1 μg/mL Hoechst 33342 diluted in PermQuench buffer for another hour at room temperature. Then, the specimens were washed with PBS five times and kept in 200 μL PBS per well for imaging. In the case of recruitment analysis to STm vacuoles, the cells were seeded on 1% (w/v) porcine gelatin pre-coated 9 mm coverslips in 24-well plates. After fixation and identical staining procedure, the coverslips were mounted using 5 μL ProLong Gold Antifade Mountant (P36930, Invitrogen). Data was plotted using Prism 7.0e (GraphPad Inc.) and presented with error bars as standard error of the mean (SEM). Significance of results was determined by non-parametric one-way ANOVA or unpaired t-test as indicated in the figure legends. Correction for multiple comparisons was performed by controlling the False Discovery Rate with Two-Stage step-up method after Benjamini, Krieger and Yekutieli. 319–326, KNIME: The Konstanz Information Miner Data Analysis Machine Learning and Applications, Studies in Classification, Data Analysis, and Knowledge Organization, Berlin, Springer. Cell Host & Microbe 13:489–500. The Journal of Experimental Medicine 210:2071–2086. Current Opinion in Chemical Biology 15:534–539. The Journal of Experimental Medicine 213:1779–1798. The Journal of Physiology 195:215–243. Cell Host & Microbe 18:527–537. Advances in Neural Information Processing Systems 25:1097–1105. Trends in Cell Biology 26:598–611. Proceedings of the 27th International Conference on Machine Learning. pp. 807–814. Antimicrobial Agents and Chemotherapy 56:4184–4188. IEEE Transactions on Systems, Man, and Cybernetics 9:62–66. International Journal of Computer Vision 115:211–252. Molecular & Cellular Proteomics 12:2952–2968. Molecular and Cellular Biology 24:8055–8068. 105–122, CellProfiler and KNIME: Open Source Tools for High Content Screening, Methods in Molecular Biology, Totowa, Humana Press. In the interests of transparency, eLife includes the editorial decision letter, peer reviews, and accompanying author responses. The reviewers appreciate that you addressed all major concerns and have no experimental questions. The reviewers point out that your manuscript fits well as a Tools and Resources article, since it is a nice proof of concept study, but doesn't provide novel biological insights. Thank you for submitting your article "An Artificial Intelligence Workflow for Defining Host-Pathogen Interactions" for consideration by eLife. Your article has been reviewed by three peer reviewers, including Markus Meissner as the guest Reviewing Editor and Reviewer #1, and the evaluation has been overseen by a Detlef Weigel as the Senior Editor. The Reviewing Editor has highlighted the concerns that require revision and/or responses, and we have included the separate reviews below for your consideration. If you have any questions, please do not hesitate to contact us. In their report Fisch et al., develop an open-source imaging platform (HRMAn) that integrates machine learning and deep learning, in order to analyse of multiple phenotypes related to host-pathogen interactions. The platform is openly available via KNIME Workflows, which will allow others to benefit the presented pipeline. The analysis follows basic principles, established by similar HCI platforms, involving illumination correction, followed by segmentation and infection detection (Stage 1). This is followed by an analysis of host protein recruitment, by detection of p62 at the parasitophorous vacuole. The authors also demonstrate that the analysis pipeline can be easily adjusted to other intracellular pathogens, such as Salmonella typhimurium. The reviewers raised some concerns regarding the technical novelty of this analysis pipeline. In particular analysis performed in Stage 1 is quite standard and follows similar methods as described before (see for example Touquet et al., 2018). The analysis in Stage 2, although well performed, does not represent a major methodogical advance in the field of machine learning. Although the authors present some applications of this analysis pipeline, it would be advisable to provide additional data, demonstrating that HRMAn can detect additional, previously established phenotypes, such as those for ROP18 or ROP5. Another application could be to probe for protein export from the parasite to the host cell, since this would broaden the analysis to detect additional host-pathogen interactions. Given that HRMAn only provides a modest improvement over existing software, primarily in the user interphase, it would be appropriate to more extensively test its function in more authentic experimental settings (see also comments of reviewer 3). The authors should also provide examples, why their analysis platform is superior. The authors acknowledge the existence of many other tools for high throughput analysis, but little to no discussion of similarities or difference to these tools is given. While all reviewers agree that the experiments have been carefully performed, there is some scepticism regarding the novelty as a method (Reviewer 2) and the breadth of applications this tool will be used for in the field (Reviewer 1 and 3). As it stands, this tool appears to be optimised for the primary research interest of the authors, where it will certainly be very useful. However, it is unclear if other researchers in the field will recognise the advantage of HRMAn over existing HCI platforms (Reviewer 1 and 3). In their report Fisch et al., describe the establishment of a novel, open source programme for High Content Imaging (HCI). The major advantage of this system is the integration of machine learning, making it probably more adaptable to the analysis of different phenotypes related to host-pathogen interactions. The data and analysis appear to be of the highest quality and there is little doubt that HRMAn is a robust new tool to automatically detect phenotypes, which will be a valuable source for HCI. Especially since it is now possible to perform genome wide screens in Toxoplasma gondii, this pipeline comes in very handy for some researchers in order to perform phenotypic, image based screens on this parasite. The authors also demonstrate that the pipeline can be easily adapted to other pathogens, using Salmonella as a proof of principle. The described technology will be very useful for researchers planning to perform image based screens on host-pathogen interactions or on intracellular pathogens in general. Therefore, this study will be certainly of interest for a broad readership. On the downside, it is a technological advance without novel biological insight. As the authors mention, there are many open source platforms available (not to mention commercial software) that allow HCI analysis of parasite growth, invasion, etc. (CellProfiler, CellClassifier, Fijii, etc.). A recent publication used a relatively simple HCI analysis to perform chemical screens in Toxoplsma gondii (see Touquet et al., 2018), which is certainly inferior to the platform presented in this study. Saying that, the described image analysis pipeline is very well designed and if widely used in the field will allow to analyse quantitative phenotypic data that are comparable in between different laboratories. The manuscript is well written and the techniques used are of the highest quality. The presented data are very solid, demonstrating that this analysis pipeline is very accurate. Unfortunately I cannot comment on machine learning, since this is outside my area of expertise. At this point the analysis pipeline is well suited for the analysis of host-pathogen interactions, in particular the characterisation of host-protein recruitment to the PV, a key interest of the Frickel lab and this aspect is of somewhat narrow interest. It would be good to summarise in an additional figure, which phenotypes this imaging platform can differentiate. For example, instead of host protein recruitment, it would be of great interest to also analyse parasite protein export into the host cell. Parasite lines expressing for example dense granule proteins are well described in the literature and it should be straight forward to add this parameter to the analysis pipeline. In summary, it is a well described analysis pipeline for HCI that might find broad applications, especially now, that genome wide screens can be performed using CRISPR/cas9. The proposed analysis will be made openly available via KNIME Workflows. This is certainly a plus since it will allow others to benefit from the presented analysis pipeline. Additionally, KNIME is easy to install, with a bit of practice very intuitive, and could on demand also be used to change/extend the workflow. The overall analysis pipeline can be divided in 3 steps. An illumination correction step followed by a segmentation and infection detection step (named 'Stage 1'), followed up by an analysis of host protein recruitment ('Stage 2'). The analysis in 'Stage 1' is not bearing surprises or any methodic novelty. The proposed pipeline, a combination of default analysis components, solves the task at hand as long as the provided images (after illumination correction) can be segmented via a simple threshold. The merit of 'Stage 1', as mentioned above, is clearly not any methodological advance or interesting combination of existing methods. It is, never the less, sensible engineering work and might very well help others that desire to perform the same analysis. In case a host protein recruitment analysis is desired, a 'Stage 2' workflow is proposed. Besides a decision tree that is used in Stage 1, this is the only place where any machine learning technique is applied. More specifically, a variant of the well known AlexNet is used to learn to classify protein recruitment. The relatively shallow network architecture and all parameter and training decisions are sensible set to values used in many neural network applications. While, as before, nothing here is even close to being a methodological advance in the field of machine learning, all decisions seem well thought trough and I have no problems believing that final classification results are good. The impact of this work will depend on the presented data and the utility of the proposed analysis pipeline (which is/will be openly available). I am, unfortunately, not the right person to judge how many research project are currently just waiting to use an analysis pipeline as the one presented in this manuscript. I would like to end my review by stating my biggest concern. After reading the title and Abstract of this manuscript, I expected the presented work to be significantly more involved. It turns out that the presented workflow uses one decision tree in Stage 1 and an 'off the shelve' AlexNet in the optional Stage 2. I would advice the authors to tone down the paper pitch in this regard. In summary, I do not believe that the presented manuscript contains enough methodological advances to justify publication of the method alone. If the presented data and performed analyses justifies publication will have to be judged by a person in the field of image-based infection biology. The last sentence in the Abstract makes a bold statement about 'operating at human capability'. This was in my point of view not shown in the manuscript and therefore ends up being a bold claim lacking justification. While I could follow all explanations about network training, some formulations could benefit from feedback by a person with publishing experience in the field of machine learning. The authors develop an open-source image analysis platform named HRMAn that relies on machine learning algorithms and deep learning. Given input images, the platform characterizes phenotypes such as parasites/vacuole, vacuole size, and host-protein recruitment. The platform is also high-throughput, allowing for the bulk submission of many images simultaneously. To validate the platform, the authors trained the algorithm with an annotated dataset of host cells infected by eGFP-expressing Toxoplasma gondii parasites. Using this training dataset, the authors quantified differences in parasite killing/growth restriction strategies across host cell lines and between Type I and Type II Toxoplasma lines. The authors also validated the algorithm's ability to quantify levels of ubiquitin and p62 recruitment to the PVM. Finally, the authors retrained the algorithm using an annotated dataset of Salmonella typhimurium, demonstrating the ability of HRMAn to recognize and quantify a diversity of pathogens. HRMAn provides a high-throughput and effective strategy for analyzing phenotypes by microscopy. The platform removes the human component of analysis and bulk-input allows for the rapid analysis of thousands of cells. The interface is remarkably easy to set-up and navigate, particularly alongside the available tutorials. The demonstration of success with two pathogens of drastically different size, Toxoplasma gondii and Salmonella typhimurium, suggests that this could be a valuable tool for a wide array of microbes. While the recruitment of host-proteins to the PVM is a potentially powerful tool, it is currently limited to binary processes (presence or absence of ubiquitin/p62). As shown, it is unclear if HRMAn can detect more subtle, non-binary phenotypes, such as recruitment of mitochondria. The authors demonstrate the ability of HRMAn to quantify differences in ubiquitin and p62 recruitment between both different host cell and different parasite lines upon IFNγ-priming. It would be desirable to demonstrate HRMAn's ability to detect previously established phenotypes, such as those of ROP18 or ROP5. This will more strongly validate HRMAn's potential ability to detect novel phenotypes. Given that HRMAn only provides a modest improvement over existing software, primarily in the user interphase, it would be appropriate to more extensively test its function in more authentic experimental settings. a) Since there are many differences between Type I and Type II parasites (including growth rate and viability, which could affect the recruitment measurements), it would be appropriate for the authors to look at isogenic lines that differ only in a particular effector. The authors could test HRMAn's ability to detect previously known phenotypes, such as the increase in GBP recruitment in a ROP18 knockout. b) It is unclear why the authors, when classifying parasites/vacuole, bin the vacuoles by 1, 2, 4, and greater than 4. The authors should provide rationale, technical or otherwise, for binning all vacuoles >4 together, since some phenotypes might emerge only later during intracellular growth. c) In Figure 2C, the example picture for >4/vac appears to be a picture of a vacuole containing 4 parasites. This should be corrected. d) It is important that the training dataset used for the manuscript be released in its entirety to ensure that readers can replicate the results of the paper and account for any differences between lab-specific assignments and HRMAn. a) The authors often use the phrase "cell" ambiguously and it is unclear if they are referring to host cells or parasite cells. The authors should take care to reduce ambiguity by more clearly stating which cells they are referring to. b) In Figure 2E, the heat map of the confusion matrix is difficult to accurately assess due to the similarity between many values. Number values should be provided as well, or in place of the matrix. c) In Figure 2—figure supplement 1A, images displaying separation of the channels should be provided. As such, it is difficult to evaluate the presence of GRA2. The current image does not seem to accurately represent the 98% prevalence of GRA2+ vacuoles. By separating the image channels this should be more apparent. The reviewers raised some concerns regarding the technical novelty of this analysis pipeline. In particular analysis performed in Stage 1 is quite standard and follows similar methods as described before (see for example Touquet et al., 2018). Thank you very much for your comments and your in-depth review of our manuscript. We agree that stage 1 of the analysis uses well-established image analysis methods. Stage 1 of the image analysis is a necessity for stage 2, hence, it is presented in the manuscript. It is an easy-to-use image analysis pipeline useful for host-pathogen researchers wanting to screen larger imaging datasets, e.g. siRNA or CRISPR screens. We therefore offer the option of just running this part of the analysis for the users’ convenience. The analysis in Stage 2, although well performed, does not represent a major methodogical advance in the field of machine learning. Yes, that is correct, stage 2 of HRMAn does not offer a stand-alone major methodological advance in the field of machine learning. The goal of stage 2 HRMAn is to make accessible and tailor a neural network-driven analysis to the researcher to define host-pathogen interaction in an unbiased, highly reproducible, sound and robust fashion. A neural network-driven pipeline is the only way to do this in an automated fashion and this approach has not been employed for the large field of host-pathogen interaction before. Having said that, the deep neural network used in this work is based on a published AlexNet architecture, yet we have changed and adopted it for the problem setting (see Figure 1). More precisely, we have added a detailed description of the derivation of HRMAlexNet in the Materials and methods section under “Deep Learning Setup and Neural Network Architecture”. Instead of optimising our architecture using off-theshelf open datasets we worked with real world data. Hence both problem and solution presented are novel. The adaptation of the network and integration into a user-friendly program makes it suitable for non-specialists and the wider research community. This was the main objective from the outset of this work – rather than advance AI, we wanted to tailor it to host-pathogen questions and make it available to biologists. We understand however, how semantics could potentially lead to confusion within the field of machine learning. To denote that we indeed have tailored a neural network approach to a problem rather than newly developed from scratch a neural network-driven solution, we have changed the title to: “Defining Host-Pathogen Interactions Employing an Artificial Intelligence Workflow”. We have added additional data to illustrate that HRMAn can indeed detect previously established phenotypes. As suggested by the reviewer, we specifically addressed the role of Tg virulence proteins within murine host defence. We repeated an experiment from Virreira Winter et al., 2011 demonstrating the influence of polymorphic, secreted Tg effector proteins ROP16, ROP18 and GRA15 on the recruitment of mGbps to the Tg vacuole. We obtained comparable results as previously published and extended the previously published results to two additional mGbps using unbiased HRMAn analysis. This data is now presented in Figure 5A. We thank the reviewers for this point and agree this would nicely expand our analysis pipeline to include parasite-derived factors. In the previously submitted version our work exclusively looked at the host cell response. We therefore performed an analysis of Tg effector protein secretion and translocation to the nucleus. To do so, we infected HFF cells using type I Tg (RH) that express HA-tagged GRA16, GRA24 and type II Tg (Pru) that express HA-tagged TgIST. Using HRMAn, we readily determined the intracellular distribution of the effector proteins and studied the relationship between uninfected and infected cells. Furthermore, HRMAn correlated the amount of effector protein fluorescence signal to the number of parasites in the cell. This data is now presented in Figure 5B. Here we beg to differ with the reviewers. Yes, HRMAn does not develop novel machine learning algorithms. However, it presents a beyond state-of-the-art image analysis pipeline for host-pathogen interaction. HRMAn, for the first time, brings AI to image analysis of host-pathogen interaction and does so in a user-friendly interface making it accessible to researchers without the ability to code. This is a major advance and advantage over currently available programs. However, we do agree with the reviewers that to further test HRMAn’s function in what reviewer 3 calls more authentic experimental settings is of benefit for the manuscript and the use of the program. We therefore added additional sets of analysis as described above (Figure 5A and 5B) specifically comparing isogenic Toxoplasma strains and we have added a murine cell line to the analysis. Collectively the analysis presented now encompasses a total of nine Tg strains, Salmonella enterica Typhimurium and 6 different cell lines from two species. We thank the reviewers for their careful assessments. We think we have addressed the comments on the novelty of the method, as well as expanded its breadth of applications (see all points above). Given that HRMAn is the only program that provides the capability of analysing protein targeting by neural networks it is more sophisticated than existing image analysis solutions. In support of its more than 1,200 views and 360 full pdf downloads on BioRxiv in 8 weeks (22.11.2018), suggests that HRMAn is already being employed by the field. In addition, besides Toxoplasma and Salmonella, we are already expanding HRMAn for analysis of other pathogens, including Chlamydia and Cryptococcus in collaboration with other labs interested in using HRMAn for their experiments. We would like to take the opportunity here to underscore that host protein recruitment to pathogens is an expanding field. While the reviewers did not comment on the fact that HRMAn can be employed for analysis of Salmonella, the anti-Salmonella immunity field is largely focused on vacuole recruitment and marking of cytosolic bacteria. Being able to recognise two pathogens with a magnitude of difference in size points to the fact that HRMAn can be adapted to an ever expanding range of pathogens, making it an attractive and important advance for the host-pathogen community at large. We thank the reviewer for their assessment and concur that HRMAn is useful for both Toxoplasma and Salmonella researchers. On the downside, it is a technological advance without novel biological insight. The focus of our manuscript was placed on the development and optimization of HRMAn as an image analysis pipeline. Having said that, there is in fact novel biological insight in this study. This is the first time 5 different human cell lines have been tested side-by-side for their response to Toxoplasma, and titrated for the IFNgdependent anti-Toxoplasma response. This data alone is of great use to the Toxoplasma immunity field as we demonstrate that various cell lines require different levels of IFNγ to mount an efficient anti-Toxoplasma response. Further, by carefully assessing a larger dataset of ubiquitin recruitment to cytosolic Salmonella in HeLa cells than has ever been analysed before, we find that HeLa cells seem to have reached their capacity of clearing Salmonella by ubiquitination and subsequent autophagy, independent of IFNγ treatment. This is a finding that has been missed by other publications before, due to insufficient numbers of bacteria manually counted. As the authors mention, there are many open source platforms available (not to mention commercial software) that allow HCI analysis of parasite growth, invasion, etc. (CellProfiler, CellClassifier, Fijii, etc.). A recent publication used a relatively simple HCI analysis to perform chemical screens in Toxoplsma gondii (see Touquet et al., 2018), which is certainly inferior to the platform presented in this study. As detailed above, stage 1 uses well-established image analysis methods. As it is a necessity for stage 2, it is presented in the manuscript. For simpler experiments it is an easy-to-use tool useful for host-pathogen researchers screening larger imaging datasets, e.g. siRNA or CRISPR screens. We therefore offer the option of running this part of the analysis for the users’ convenience. Stage 2 of the analysis pipeline – the stage that assesses the host-parasite interaction dimension – is the innovation of HRMAn. Rather than simple pixel enumeration, stage 2 employs a deep learning neural network to assess host protein recruitment to the pathogen. This is currently not achievable by any image analysis program available, neither commercial nor open-source. Thank you for your comment and thought. In fact, all readouts that HRMAn produces during the image analysis are already summarised in Figure 1. We have added another figure of additional data showing how HRMAn can easily be used to study pathogen biology as well (Figure 5). The new experiments for this figure are described above. Many of the readouts that HRMAn calculates can be used for both parameters of an infection, e.g. the readout of recruitment of host proteins to the vacuole can equally be used to study display or absence of pathogen proteins at the vacuole. This only requires different staining of the microscopy samples. The same can be said about the replication and growth characterisation of pathogens. The measurements performed by HRMAn could be used to study the effect of pathogen gene knockouts or protein depletion that result in growth phenotypes. We want to bring to the reviewer’s attention, as detailed above, that HRMAn not only works for analysis of Toxoplasma infection, but also Salmonella. Cumulatively, these two fields account for a large community of researchers that share an interest in host defence to pathogens. As we demonstrate the versatility of HRMAn in this manuscript by choosing two pathogens of very different size, it is easy to envision that HRMAn will be adaptable to other pathogens in the future. As detailed above, we now demonstrate that HRMAn can analyse the localisation of Toxoplasma proteins in host cells including GRA16, GRA24 and TgIST. This is now included as Figure 5A. We thank the reviewer for his assessment. As mentioned above, stage 1 of the analysis uses well-established image analysis methods and was not touted as novel methodology. Stage 1 is essential for stage 2, with the advantage that it provides an easy-to-use, robust tool for screening large imaging datasets. Thank you for your comment. We would like to emphasise that HRMAn has been designed for biologist. As such, we decided to keep the machine learning algorithms as simple as possible, to save on computing resources and to prevent overcomplicating the analysis and its set-up. As shown for the decision tree classifier, we tested different commonly used algorithms and settings and chose the simplest and most robust option. It is worth mentioning, that the neural network architecture presented in the current manuscript is different from the original AlexNet and adopted for the problem setting (see Figure 1). While having the same number of convolutional layers, their dimensions are different. Furthermore, unlike the network presented by Krizhevsky et al., it is not parallelised in two streams aimed for two GPUs. Instead the optimisation of our network runs on a single GPU making it more accessible for the end user (setups with dual GPUs are quite rare and difficult to operate in biological labs). It mimics the AlexNet in an effort to minimize the number of hyperparameters to optimize. Given the number of hyperparameter changes it is a new architecture. Provided the fact that the network has been optimized on the real-world data, rather than publicly available datasets, proved to be solvable, alighting as close as possible to a known solution is dictated by the good engineering practice. Nonetheless beyond architectural novelty, HRMAn is a framework allowing for swappable architectural solutions. It supports state-of-the-art libraries like DL4J. Keras is upcoming, which will allow rapid adoption of most advance algorithms on the realworld data. We have now detailed the exact modifications we performed to create HRMAlexNet – the neural network architecture of HRMAn in the Materials and methods section under the points “Deep Learning Setup and Neural Network Architecture” and “Neural Network Training and Hyperparameters Optimization”. As suggested, to complement Supplementary file 1, we now review other analysis solutions in light of HRMAn in the Introduction part as mentioned above. Since its deposition on BioRxiv the manuscript has been downloaded 360 and the Abstract read more than 1200 times (22.11.2018). We have already received more than 10 requests for early-access to the GitHub repository. HRMAn is currently being used and further developed in 7 labs, that we know of, prior to official publication (22.11.18). As pointed out above, to not mislead the reader, we have re-titled our manuscript “Defining Host-Pathogen Interactions Employing an Artificial Intelligence Workflow”. We would like to point out that beyond designing HRMAlexNet, as mentioned above we have presented a novel methodology of visualization of the phenotypic attention of the trained neural network. Through class-activation map generation (occlusion map method) we show the fraction of the pathogen micrograph important for evaluation of the host-pathogen interaction (Figure 2). In our opinion, this pushes the boundary of the conventional machine learning toward artificial intelligence-based analysis. Unbiased attention visualization allows us to leverage on the unsupervised component of the HRMAlexNet responsible for learning from the presented data to promote data-driven discovery. We have now amended the text to point out these advances/differences. Considering the reviewers concerns, we have significantly improved the presentation of HRMAn through additional experimental analysis, a refined description of HRMAn and its novelty, as well as by comparing our analysis solution to other existing programs. Thank you for your comment, but we feel this statement is justified. We demonstrate in our cross-validation 92% accuracy with the use of trained CNNs. This high accuracy combined with the throughput of HRMAn (classification of more than 100,000 vacuoles in just one afternoon) in fact far exceeds human capabilities. The manuscript has now been revised by a Google engineer specializing in CNNs and updated accordingly. As detailed above, we have repeated the experiment of mGbps recruitment to the Tg vacuole presented in Virreira Winter et al., 2011. The influence of polymorphic, secreted Tg effector proteins ROP16, ROP18 and GRA15 on the mGbp1 recruitment phenotype was demonstrated in this publication. We find that HRMAn produces identical results as manual scoring by humans, however, the number of vacuoles analysed far exceeds what has been done previously. Additionally, we now analysed not only mGbp1, but also mGbp2 and 5 recruitment to the PV. The new data is now presented in Figure 5A. Vacuoles were binned into 4 or more parasites as when vacuoles contain more than 4 parasites it is difficult to distinguish, even by eye, exactly how many parasites are contained within. For our purposes, this would result in unreliable data. That said, use of KNIME Analytics platform will allow users to easily adjust and re-train their classifiers, according to their data confidence level. Thank you for the comment, we have replaced the image with an image that has more than four parasites in the same vacuole and added scale bars to all images. The trained CNNs will be distributed through our own homepage hrman.org and the GitHub repository. Additionally, we have now stated that “images used for training of the machine learning algorithms will be available through the Crick Institute’s online file exchange system upon request.” in the Materials and methods section. Thank you for your comment. We have updated the text to more clearly distinguish between the host cell and pathogens. We thank the reviewer for this comment and have now added values into the panels of Figure 2E and Figure 4D to make it easier for the reader to assess the accuracy of the classification. Thank you for the suggestion. We have added the individual channels as black and white images for easier visualisation and inspection by the reader. We thank all members of the Frickel lab for productive discussion. We thank Mohamed-Ali Hakimi for providing transgenic Toxoplasma lines. We thank Valentin Bazarevsky and Stefan Helfrich for discussion and critical reading of the manuscript. This work was supported by the Francis Crick Institute, which receives its core funding from Cancer Research UK (FC001076), the UK Medical Research Council (FC001076), and the Wellcome Trust (FC001076). EMF was supported by a Wellcome Trust Career Development Fellowship (091664/B/10/Z). DF was supported by a Boehringer Ingelheim Fonds PhD fellowship. AY, JM were supported by core funding to the MRC Laboratory for Molecular Cell Biology at University College London (JM), the European Research Council (649101-UbiProPox), the UK Medical Research Council (MC_UU12018/7). © 2019, Fisch et al.